A mild soup when I want something light but tart and flavorful. 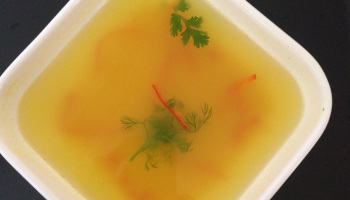 You’ll strain the soup to remove the chunks of lemongrass, lemon zest, ginger and bay leaf before serving. Heat 1 tsp olive oil in a pot over medium heat. Add garlic, onion, ginger. Cook, stirring occasionally, until tender, about 3-4 minutes. Whisk in chicken stock, lemon grass, lemon zest, bay leaf and bring to a boil. Pour soup thru strainer to remove lemongrass, lemon zest, ginger and bay leaf. This entry was posted in Uncategorized on June 2, 2016 by goddess.